Repsol Honda’s Marc Marquez got to grips with the challenging track surface at AutÃ³dromo Termas de RÃ­o Hondo, posting a lap time of 1’39.313 to finish quickest in Friday practice at the Argentina Grand Prix. 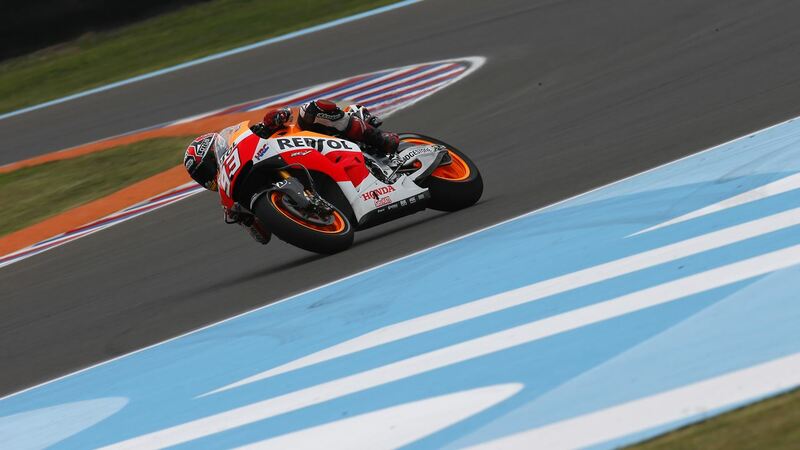 Marquez’s quickest lap was set using the medium compound front and hard compound rear slicks, the same combination his teammate Dani Pedrosa used to achieve the second-quickest time of 1’40.396. Third quickest today was NGM Forward Racing’s Aleix Espargaro, who set a personal best time of 1’40.566. Track conditions were poor on the first day of the race weekend, with heavy deposits of sand and a lack of rubber on the asphalt combining to reduce grip levels and increasing tyre wear. The dirty track and low track temperatures in FP1 resulted in very high abrasion levels for the rear tyre, but conditions marginally improved for FP2 which helped return grip and tyre wear to a more reasonable level. Today’s peak track temperature of 34°C was recorded at the end of FP2. With grip hard to come by on the dusty track surface, the soft compound front slick was the preferred option in FP1, while the medium compound front slick was more popular in the warmer FP2 session. All three rear slick compound options were evaluated by riders today, with all specifications providing good performance around the fast Termas de RÃ­o Hondo track. With conditions set to improve again tomorrow, riders will use Saturday to determine their preferred tyre choice. “In general, I am happy with the first day of practice here in Argentina, especially as I finished as the leading Yamaha. The circuit is as nice as it seemed to be and it was not different from my expectations, with my favourite part being the last corner. It feels like riding Supermotard back at Colin’s Ranch, it’s just amazing! The main point of today was to learn the circuit, and to establish a base setup which we achieved, and I feel confident with. I am still not sure on the choice of tyre, but tomorrow I will ride on both varieties in order to decide which one to use when the track surface will be cleaner. We will continue to look at modifying the setup in tomorrows session, as we need to improve the race pace a bit more. However, I’m confident that we are in a good position to qualify well and fight for a strong result on race day”. “Today was positive for me, and my impressions of the new circuit here in Argentina were good – it’s different to the other tracks we visit, which makes it more entertaining to ride.The layout is really nice, it is technical with long, fast and blind corners. My favourite part is probably T4 where you have to change direction quickly, and also the last corner. Actually, my pace in this sector was also strong, but I have to improve the first one where I was losing time and we will work to develop this area tonight. Another aspect where we still have some margin to refine is the front setup of the bike, but the feelings are positive especially because I have been competitive straight away this morning. “Today we faced a very dirty track: in these conditions it’s very difficult to understand which tyre can work properly. In any case, we need to work hard on the bike set-up to improve its behavior: In this moment I am forced to use a lot the throttle to make the bike turn, and doing so I stress a lot the rear tyre, and as a result the tyre performance drops quickly. As happened today from morning to afternoon, the track conditions change very quickly: today, the other riders were able to improve more than us. Surely tomorrow the conditions will be even better, but we need to do our best regardless. After that, we will wait until the last minute to decide which tire to use for the race”. “The first free practice session was good, despite a very dirty track, while in the second session I struggled with bike set-up: we tried various solution to try to find the right direction, and we have already some ideas ideas on the changes to be made tomorrow, especially regarding the suspension. The situation is complicated even with regard to the tyres, which drop a lot after only 4 laps: therefore, we don’t know yet which tyre we will for the race. We’ll decide it tomorrow, when the conditions will be definitely better, with more rubber on the asphalt”.